The Lakenvelder is thought to originate from the Westfalen area of Germany as long ago as the 1830s. 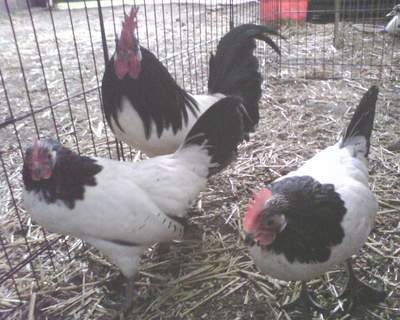 The name, however, is Dutch and is believed to mean a shadow on a sheet and describes their striking black and white plumage. 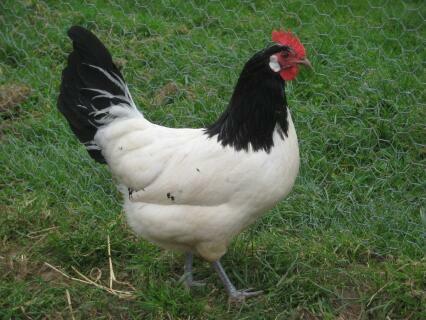 There is also a bantam version and a blue variety which was developed in the Netherlands and brought to the UK. They have a medium sized single comb, white almond shaped ear lobes and an orange-red eye. The legs are featherless and slate blue and they have four toes. They are a slightly built breed with an elongated body and a tail which is carried high. They make a very good utility bird and have white skin and a particularly plump breast. They are seen quite rarely in the United States but always attract attention. 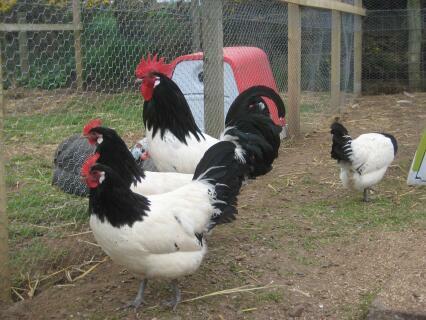 They are fairly small birds and are good layers, producing white shelled or occasionally tinted eggs. The hens are not good sitters and tend to be rather flighty and wild so need to be contained carefully with suitable fencing as they can manage a 2½ metre flight. Chicks mature quickly and grow vigorously but they don't gain their characteristic markings until they have been through their third moult. They are confident, robust birds which tend to avoid human contact and are able to adapt to being kept in confined spaces but prefer to be allowed the freedom to free range. Males weigh around 5-6 lbs while the females are from 3-4½ lbs. 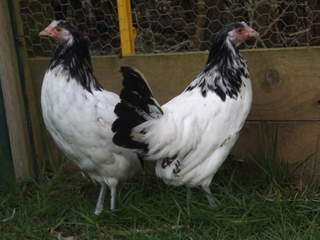 The Lakenvelder is generally seen in the black and white form known as Belted but there is also a blue variety which is described as Blue Marked. 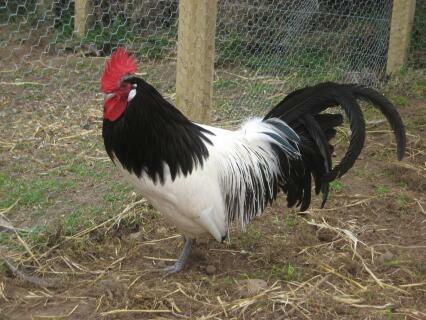 I have a Rooster of this variety. He guards our chickens well, He is very flighty and I think to be honest probably doesn't even like me, but he does his job so damn well I don't care. He is very attentive, in fact he will eat last so he can keep an eye while the hens eat there food. He is always looking for feed for them and then calling the hens to let them know where it is and then while they feed he will get on a high place and look for predators. We have quite a few around here and in the past year since he arrived have not lost a single chicken. I have only had one Lakenvelder. She is a striking bird to look at and despite being called a poor layer has produced eggs with equal consistency to my Easter Egger. The eggs are about 5g smaller than the other chickens. She is an active forager and will eat bugs out of my hand, not at all scared of humans but not fond of being handled either. She does occasionally get stressed at egg time and run around acting flighty. She also tends to be loud, crowing and barking in the early morning when she wants out or cannot find her friend in the garden. Probably a better bird for a country flock with more space. She is excellent at avoiding predators, especially hawks. Our Lakenvelders are smart, adaptable, nervy and very alert. They are excellent flyers - 3m vertical lift from a standstill and a 10m+ glide from a fencepost - and this needs to be borne in mind when planning housing. We don't attempt to contain ours; they free-range widely over 10 acres, but always come back to their coop as soon as the light begins to fade. 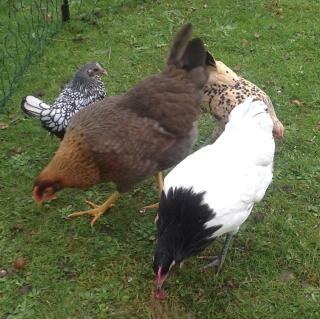 Would like to swap either a pullet or two or a cockerel fort similar from another breed line.